– Thomas Hobbes, on the state of nature. The Sopranos and The West Wing aside, I’m rarely susceptible to find myself immersed in a TV series. Though, Ed Balls on Strictly Come Dancing is surely testing that. I’m not great with fantasy shows either. My partner and I gave Game of Thrones a go, but it didn’t captivate me at all. Which is why giving The Walking Dead a try seemed like it’d end up with me dropping it from my weekly schedule within a few episodes. Six seasons later, and I’m addicted. “It’s not enough to ‘change the channel,’ as some people like to advocate, because cable subscribers — regardless of whether they want AMC or watch its programming — are still forced to subsidize violent content. – An odd criticism. It’s the equivalent of not liking a couple pages in a book you’ve brought, and so demanding control over the entire thing. The PTC go on to suggest TV producers should ‘imply’ the violent content, rather than actually show it. Thank god we adults, watching an adult’s show, have the PTC to protect our vulnerable minds. And whilst its critics seem to be under the impression that the brutality of the opening of the season was ‘lazy’ and ‘just for ratings’, done simply for ‘shock value’ I’m convinced it was a spectacular opening based on the very philosophical underpinning of the show, with much of the criticisms ironically heaped in lazy understanding of the point of the show. Indeed, I’ve found those who insist they’re boycotting the show because it has become too brutal and lazy, to be somewhat unnerving. It implies they didn’t consider dead people with flesh hanging off eating live people to be too brutal, nor a sect of cannibals too brutal, nor a beheading too brutal, nor a mother giving birth, dying, and being show by her son before turning into a face eating zombie too brutal, but a favoured character is killed off and it’s suddenly too much. If brutal is your starting point, it is perhaps best to start at flesh eating dead people. Allow me to explain why I like The Walking Dead, and why it gets me thinking. The premise of the show isn’t zombies, or surviving a zombie take over. If that was it, I’d be bored quickly. Zombies, vampires, elves, or the like, are something I find little interest in reading or watching. The premise of the show is essentially Hobbes’ state of nature and attempts to break out of it into a civilised community. This is excellently highlighted when we look at the main protagonist – Rick. Rick embodies the old World; has property, has a family, a respected member of a community, is a member of law enforcement – the very structure that when dissolved, has catastrophic consequences. And yet, in the new wilderness, he’s a killer, forced to make ethical choices that would be beyond even a nightmare back in the civilised World. And so it is, that the show highlights humans at their rawest, when government, legal systems, protections for liberty, social contracts, property rights, no longer exist, and all that exists are individuals and small groups fighting for resources. When a state of nature leaves everyone open to the mercy of others, and necessitates banding together and a leader emerging, how humans cope with the brutality of a society-less society. How do we balance personal freedom, with group security? How do we trade when there is no moderator to enforce contracts and security? After experiencing strangers trying to kill you, when you finally find refuge and new strangers appear, knowing that resources are like gold dust, how do you respond? What is the ethical approach? When currency has no value, because supplies and resources are free to the one who kills, how do you plan? Whether or not the shows producers have Hobbes, or Locke, or any other social contract theorist in mind when writing the show, is irrelevant, because it enshrines that in its very premise. Establishing communities in a hostile, lawless state of nature underpins the show. – And so humans band together, appointing a leader solely for protection. Survival is it, by any means necessary in such a state. Law within those communities is created and enforced by the leader, for the advancement of the group, or so it is presumed. What we’re finding out on the show, is that a state of nature doesn’t suddenly end the moment individuals band together for protection. Protection is fleeting and a largely a mirage. We now have small groups fighting over resources and often brutally. In the real World, nations, religions, tribes showcase the same base instincts. The Walking Dead has me thinking how easy it is for once civilised people from bustling lives, with tea and crumpets before work, with flowers growing in the garden, suddenly descend into our base instincts when the precarious foundations of institutional constructs collapse, and how survival may turn us to the brutal hunter gatherers that we are. Far from ‘dehumanising’ us, I think it humanises us in our rawest form, in a state of nature, a state the PTC and others seek to protect us all from, and that is what terrifies us. Brexit Blasphemy & Easily Triggered Right Wingers. Over the past few years, I’ve written on a few occasions on the subject of the importance of free expression when dissenting & challenging prevailing wisdom. Whether that be challenging religious dogma, or political ideals. Those – like the National Union of Students – dedicated as they are to creating ‘safe spaces’ where topics are off-limits, not only silence dissent, but take it upon themselves to ban my right to hear dissenting views and come to my own conclusion. There’s is a form of banning blasphemy. But it isn’t just the left & religious conservatives that has taken it upon themselves themselves to attempt to silence dissent. As far as I can tell, apart from David Lammy and a small group of MPs, there is less a will to overturn the EU referendum vote, and more a will among remainers – like me – to consistently scrutinise the winning side, and ensure our voice is heard when a deal is reached. The problem is, this is quickly being cast as an attempt to subvert the ‘will of the people‘. By that, they mean just 52% of a small number of people who actually bothered to vote. By extension, this implies that any representation of the 48% or any scrutiny of the winning side, is to be viewed as some sort of elitist threat to the people. Or, as I’m calling it, Brexit Blasphemy. – The dangerous ‘patriot/traitor’ rhetoric is alive across social media, but more worryingly, it exists right at the top of the print media world. Jo Cox was the victim of that hyperbole, and that level of violent rhetoric. Those of us challenging the winning side, with scrutiny are cast as the anti-British enemy of the people. Those who voted Leave cast themselves as patriots, implying that if I voted to remain, I am not a patriot. But I do not recall voting on who gets the right to define what it means to love one’s country. Indeed, I adore my country, so much so that I believe any right I claim for myself, I must defend for others, and that to be anti-British, is to attack values of free expression, inquiry, and democratic scrutiny. If I vote on decisions that will have wide ranging implications on the lives of those who voted against, I expect those people to free to express their voice, or be given representation moving forward. These people do not own the concept of patriotism. It is not for the far-right and no one else. The language – ‘unpatriotics’, ‘damn’, ‘plot’, ‘subvert’ to refer to dissenters, whilst the British people (which, remember, means 52% of people) are cast as the victims…. it is the creation of an atmosphere of hate based solely on the appropriation of the Union Jack for a small section of people who voted in a single referendum. 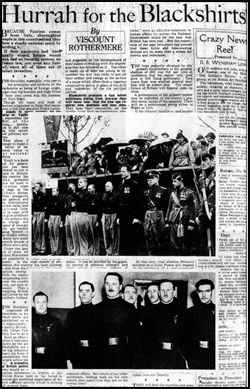 The irony of course, is that for the Daily Mail to be consistent, it must not scrutinise, nor criticise any government ever again, because to do so would be to ‘subvert the will of the British people‘. – There is something fundamentally anti-British, illiberal, and anti-democratic in the idea that those keeping check on the winning side of a vote, must be silenced. Which is a spectacular irony, given they ran a campaign on the basis of taking back democracy. Let’s us be clear; silencing criticism of a political position, is not a British value. Democracy is not just a vote on a piece of paper. It is pressure groups, it is criticism of each side and their ideas, it is scrutiny of the victors, it is holding claims to account, it is free expression and inquiry. – For The Express, the winning idea or the prevailing norm must be challenged…. unless they’re on the winning side, then dissenters must be silenced. The winning idea thus becomes untouchable, closed to criticism, it’s an idea – like Islam in countries that ban criticism of it – that becomes sacred, like a religion. To criticise it, to dissent, to think for yourself, becomes a thought crime, and you are told you are a traitor (or apostate, blasphemer, take your pick). And so the idea that was presented as fighting the elites, taking on the establishment, has itself become elitist, and the establishment, and seeks to enshrine that position by recasting criticism as blasphemous. – It is remainers who are ‘damaging Britain’. It’s as if these people simply expected literally no criticism of their position, and for those of us completely opposed to their position, to shut up and embrace it. Indeed, highlighting the importance of the single market to jobs in this country, is referred to as ‘damaging Britain’. He doesn’t seek to reassure people, he simply casts them as traitors if they question. Those businesses struggling to understand what comes next, those jobs threatened are considered unimportant, and so it further implies that if those jobs are lost it is not ‘damage’ because it is all in aid of the one true religion. Individuals cease to be considered as anything more than cogs in a nationalist machine… a vastly illiberal principle. And here’s the bizarre thing, the case for Brexit was based on the will, the sovereignty of the British public, the individual voter, and Parliament. All of us together, draped in a Union Jack. Once Brexit was voted on, suddenly the future of the country is is the sovereignty of Brexit voters – Patriots – only, and in particular David Davis, Boris Johnson, and Liam Fox. Public critics are simply traitors who should be ignored rather than debated, and Parliament just gets in the way of three men. By implication, it narrows the debate over the future, which ensures not an arena of ideas and progress, but a stagnant echo chamber. It’s a mad reversal from democratic accountability, to autocratic control and silencing, in the space of about four months. An incredible change of heart. – Whether Brexiters like it or not, their idea is not inherently untouchable nor is it without fault, and crucially, and I can’t stress this enough…. they do not own the concept of what it means to love this country. Their position isn’t one of love for Britain whilst mine is disdain for Britain. We simply come at our love for our country, from a different position, and I would further argue that attempts to silence criticism of ideas, to cast them as villains to be taken on, and to incite hatred of people for views held is about as far from the British ideal of individual liberty, open debate, and democratic society that I think I’ve ever come across. Brexit must be open to scrutiny, to mockery, to criticism, to questioning, just like every other idea must be. Ideas that have an impact on the lives of others – religious, political… and yes, this includes immigration – must not be off limits to criticism or demonised. They must be challenged. Scrutiny does not end once a vote is won. Indeed, if I am being told that I must lose my EU Citizenship without my full consent, I must be free to criticise that idea. Whether you as an individual listen to me or not, is not something I care for. You’re entitled to ignore me all you want. But if you seek to cast me as the unpatriotic villain, simply for not agreeing with you, and dismissing my voice from public debate The liberal principle of free inquiry, free expression, and vocal dissent is not anti-democratic, nor subverting the will of the people, it is democracy in itself, and a complete defence of the individual right to dissent and challenge the victors. That is a fundamental British value. Brexit-blasphemy isn’t. You are currently browsing the Futile Democracy blog archives for October, 2016.